Hi, I am Laurie Breadmore I have been residing in Dubai for 2 yrs and have just returned to Rotorua, New Zealand. “I really don’t remember the first piece I stitched. My mother stitched doing embroidery, quilting and crochet, and she also did all manner of crafts and household stitching from whenever I could remember. She passed on all these to us girls of which there are three, but I am the only one who continued with stitching as a hobby. I recollect sewing on “sewing cards” at school in UK, so I must have been around 5 or 6 years old then. I was making doll clothes maybe around 8 years old when I could use the machine and got into real trouble when I caught my little sister’s finger under the needle at 10 yrs old. The first stitch for embroidery I remember using on a hanky was lazy daisy stitch; of course it was an iron on transfer. Also, I made the inevitable tray cloth, with stem stitch and daisies and back stitch which I could never keep to a regular size much to my mother’s annoyance. My first piece as an adult was a bell pull in Cross Stitch of a trip we took to Denmark depicting our stay there so I must have been 18yrs old. I have tried all kinds from simple embroidery to Hardanger, stump work, black work, Brazilian, crewel work, gold work, ribbon embroidery, Schwalm, canvas work, quilting and patchwork, and numerous others which go under different names. As we have been nomadic for 31 years now in 12 different countries all with my husband Eric’s work. I have had countless hours to devote to needlework. In Dubai I maybe spent 6 to 8 hours a day, mainly as it was so hot between 40 – 45 degrees (c). I found I was not enticed out so often and had hours to kill…..I had the pleasure of all this time to concentrate on whatever I wish with no guilt feelings at all. 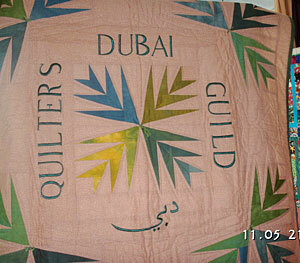 My hobbies are quilting and embroidery and for the last year I was the Vice president of the Dubai Quilters Guild, a very well attended group of about 80 members of all nationalities. There I have taught a few classes not only in Quilting but also embroidery. I organized the Block of the Month last year and each of the nine panels was embroidered. Many ladies had never embroidered much before and really enjoyed this, as it took in their quilting as well as the stitching. When back in New Zealand, I belong to the Rainbow Quilters and Embroiders Guild in Rotorua, where a group of us do try other crafts. I went of to university at 40yrs old and received my diploma in Health Management the same year as my Daughter received hers for Nursing. I have not worked for many years, but when I did it was in the Health Service. I finally became manager of a Health Centre for a few years before we emigrated from UK to New Zealand to retire. I took an HNC course in Design and Embroidery when my children were very small, with a view to teach at some point, but never quite made it as I followed my husband with his career. We actually retired 7 yrs ago. You are probably thinking retired in New Zealand how about Dubai, yes! We have retired twice and each time my husband becomes bored, so it’s off we trot again. But life is always interesting and he is in demand and never really looks for work, it seems to find him. We have lived and worked in 12 countries including France, USA, China, Spain, UK, Kuwait, Jordan, Philippines, Bahrain, and Dubai to name a few and some of them more than once. In the years we have been traveling/working we raised two children who went off to boarding school and came home in the summer holidays to a new home in a different country. Did it harm them? I don’t think so as they are well educated, independent people with families of their own now, with horizons as wide as the world. Both my children have stitched. My daughter, Kathryn, embroiders and quilts and my son, Iain, also has had a go at cross stitch in his younger days. He started a cross stitch of his own design of a Ferrari car which he never completed and it was put away in the attic. It was found 20 years later by my daughter who copied it and then framed his unfinished version, the graph paper design he did, and her completed piece and presented it to him for Christmas…wow!! What a hit and it bought tears to his eyes. What a neat gift. I have not really picked up any techniques from all the countries we have lived in but have seen some wonderful work done by the different women. I have at least 4 quilts in various stages. I keep getting side tracked and a drawer full of “maybe one day patterns”. “Bits of wisdom” would be to tell you: don’t worry about those UFO’s. There is always a time for them at a later date, and if you have anything you know you will never complete, offer it to a friend or advertise it, because someone else will love it. “Trash and Treasure” – what is trash to one is treasure to another. I do not like to do commissions, but I am willing to work with the person to teach them how to do it for themselves. This way they appreciate the time energy and love for themselves, all while learning a new skill. When I give a piece of my needlework or patchwork away I have had various reactions, mostly good. I love the reaction when you give something hand-made especially to someone who appreciates the work that has gone into it and that it was made especially for them. I am now careful what I give to whom as I have seen my hard work treated with not a lot of respect. Some folks just have no concept of the work and love that goes into projects. 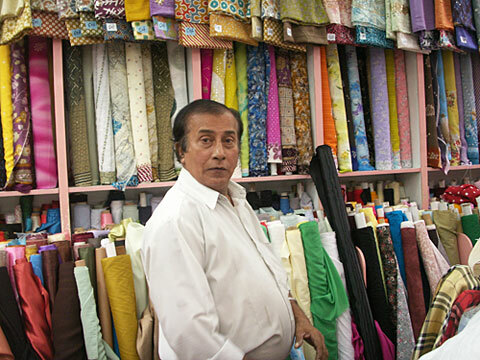 In Dubai, fabrics were so cheap that I had the permission of the wage earner to stock up ready for our return to NZ which I did with no holds barred. I now store my small projects in clear A4 zip around folders available at stationers. They hold so much and seem to expand and they file on to a shelf and stand up so you are able to see at a glance what is inside, instead of putting into a drawer and never seeing the light of day again. If you put UFO’s away where they are unseen, you will never get them out again. What Has Needlework Meant in My Life? It has and is a life saver. I have spent many many, long hours stitching in various countries where I did not speak the language or it was not possible to go out on ones own. I also enjoy passing on my skills to young and old alike and it is always an ice breaker. When I couldn’t speak the language of people in the countries we lived in, it always drew interest and they tried to tell me about their handy work, be it stitching or crafts. I have enjoyed all my stitching as it has bought me friends all around the world and it means I am never without something to do, be it small and taken on the plane when we travel or on a floor frame only to done at home. I am so pleased to have passed on this skill to my daughter, unfortunately I have only grandsons 4 of them Ellis, Ben, Harvey and Alex, and so it looks like it will stop with her although there are always Grand-Daughters in law in the future. Wow! You have had an incredible life so far! Thank you for sharing your experiences and I know what you mean about some people not treating your gifts with a lot of respect. I enjoyed your post very much! I enjoyed reading that Laurie. ( Laurie and I have met since she returned to NZ to live )You have travelled the world as much as I have not, but we have a wonderful hobby in common. See you again soon I hope Ali.